Many of you know that October is breast cancer awareness month, the perfect time for dietitians to remind clients about the importance of annual screenings, breast self-exams, diet and nutrition, and physical activity recommendations for prevention and recurrence. In this issue, Today's Dietitian has an article on breast cancer survivors and exercise, and we also cover the landmark report from the American Institute for Cancer Research and World Cancer Research Fund that provides updated recommendations for lowering cancer risk. However, before I go into more detail about the report, I want to share some good news I learned about the latest statistics on breast cancer and other common cancers in the United States. Breast cancer is the leading cause of cancer death among US women aged 20 to 39, and more than 260,000 US women and 2,500 men will be diagnosed with breast cancer this year. However, according to the Susan G. Komen organization, the world's largest nonprofit source of funding for breast cancer research, community health outreach, advocacy, and programs in more than 60 countries, its efforts in raising awareness and more than $956 million to date for breast cancer research have helped reduce the mortality rate from breast cancer in the United States by 39% from 1989 to 2015. Its goal is to reduce the number of US breast cancer deaths by 50% by 2026. The cancer death rate in the United States has increasingly declined over the past 20 years, according to the American Cancer Society, due to lowering death rates for lung, breast, prostate, and colorectal cancers resulting from a decrease in tobacco use and earlier detection and treatment. As of 2015, the cancer death rate for men and women combined had decreased 26% from its peak in 1991, translating to almost 2.4 million lives spared during this period. While this is good news, individuals and the health care community here and abroad still have much more work to do in the fight against cancer because in 2018 alone there will be close to 2 million new cancer diagnoses. The article "New Landmark Report on Cancer Prevention," on page 36, discusses the details of the latest recommendations for cancer prevention and provides strategies on how to discuss them with patients during counseling sessions. 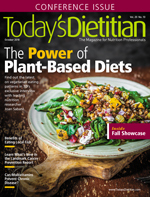 Please enjoy the other articles on local fish and multivitamin and mineral use, and a Q&A with Joan Sabaté, MD, DrPH, on the power of plant-based diets.